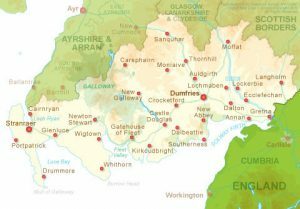 There is not a lot of information about the Milligan family in Scotland. Jack Milligan said the Milligans were horse-thieves and cattle rustlers who went back and forth across the English border. Other people are convinced that the name Milligan is Irish because it sounds like Mulligan. And here is a good possibility of a Saxony /Normandy origin in an 800-page book that can be found online: History of the Families of Millingas and Millanges of Saxony and Normandy Comprising Genealogies and Biographies of Their Posterity Surnamed Milliken , Millikin , Millikan , Millican , Milligan , Mulliken, A.D. 800 –A.D. 1907 by Rev. Gideon Tibbetts Ridlon. It gives the following information about a family that seems to be our Milligans, up to 1907.
p. 101 “Robert Milligan, a son of James Milligan and Margaret Wallace (descended from Sir William Wallace), was of the ancient family of Milligans in Galloway, Scotland. 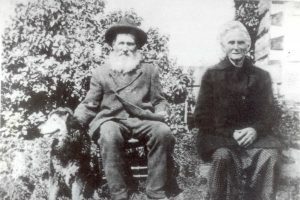 He married Sarah Hastings 1832 and came to Canada in March, 1836 settling on a farm in Fergus, Nichol Township. He subsequently removed to Bentinck Township, Grey County, where the family remained until death. He d. Feb. 12, 1869; his widow d. March 25, 1876. He was a shepherd in Scotland, employed in driving cattle and sheep to English markets. Children as follows; 1. James Milligan, b. Sept. 19, 1833, in Kircudbright, Scotland, and came to Canada in 1836 with his parents. He m. March 1, 1864, Annie MacPherson, and lived in Bentinck, Ontario, until 1879; then sold his farm and moved to Gore Bay, Manitoulin Island, where he now resides.2. William Milligan, b. in Galloway, Scotland, Nov. 24, 1835; came with his parents to Canada in 1836. He m. June 21, 1859, Margaret McNicol. Was a farmer in Bentinck until his d. which occurred Feb. 13, 1887. His widow is still living. Parishes of Dalry and Carsphairn births and baptisms list three Milligans:  Robert Milligan son of James Milligan February 2, 1790: [Dalry] Baptism of Robert Milligan a child of James Milligan and Margaret Wallace, his spouse, in Bridge of Ken. James Milligan son of Robert Milligan September 19, 1833: [Carsphairn] Birth of James Milligan son of Robert Milligan in Castlemaddie, Kirkcudbright, Scotland and Sarah Hastings his spouse. William Milligan son of Robert Milligan November 24, 1835: [Carsphairn] Birth of William Milligan second son of Robert Milligan in Liggate and Sarah Hastings his spouse. *note – typographical errors from Ridlon book have been corrected. Robert Milligan, Sarah Hastings Milligan, and their two sons James and William came to Canada on board the Belvidera, leaving Liverpool in March and arriving in New York May 30, 1836, after eight weeks of sailing. Accompanying them on the voyage was Sarah’s sister Jane, married to David Haistings (or Hastings) and their four children. According to Jane Hastings’ account in the Ennotsville history (hastings_family_history_nicholtwp) they encountered severe storms in the Atlantic Ocean and were driven back one hundred and fifty miles in one night’s storm. Unlike their siblings who went to Australia two years later, the Canadian-bound families arrived without any deaths (so far as is known). There is some discussion that a son Archibald died on board the voyage, but given the birth of William in November, 1835, this seems very unlikely. The two families had to make their way from New York to Upper Canada. They were towed down the canal with horses to Rochester,then to Lake Ontario and finally arrived in Hamilton. The journey from Hamilton to Guelph was made by ox cart – arriving in June, 1836. Jane and David Hastings settled in Puslinch Township and then moved to Eramosa for a short while. The earliest recorded location for Robert and Sarah Milligan is Fergus, Nichol Township, between Elora and Guelph, Ontario. Two daughters were born in Canada, Sarah in 1842 and Margaret in 1844. James bought Lots 18 and 19 in 1853 but assigned his interest in the lands to his father Robert Milligan in 1855. Robert received letters patent (official recognition of title to the property) in 1864. It was not uncommon for letters patent to be assigned so long after the fact. In 1855 Robert, Sarah and daughters Margaret and Sarah followed James and William to Bentinck Township. According to Margaret Milligan Mervyn’s obituary in 1932, it was no easy task to move to the strange new township. Margaret, age 11, was required to drive a herd of seven cattle and two pigs to the lot in Bentinck. The Saugeen River was in flood and the animals had to be driven through the water. Lot 18 was bisected by the River Styx, a tributary of the Saugeen. 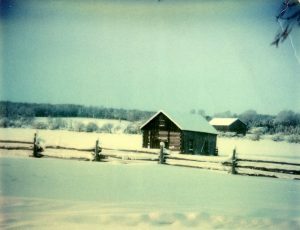 A temporary dwelling was erected by the Styx and later a substantial log building was built.These two photos show the original log house as it stood on lot 18 and then rebuilt on a cousin’s lot in Normanby Township in the 1980s. The solid oak logs were in excellent shape except for the bottom round. On March 1, 1864 James Milligan married Annie McPherson age 17, the same day as his sister Margaret married Alexander Mervyn. The ceremonies were performed by William B. Evans at the Church of England Parish of Durham. Lot 18 was sold back to James Milligan by his father Robert Milligan in 1867. In the 1871 census, Annie and James Milligan had three children, Annie, age 5, Robert Wallace age 3 and Gordon age 1. Church affiliation was Presbyterian for James and the children and Church of England for Annie (whose birthplace was given as Ireland). According to a Hastings gravestone in Scotland (see Hastings link for more information) Robert Milligan died February 12, 1869, and Sarah died March 25, 1876, both in Ontario. 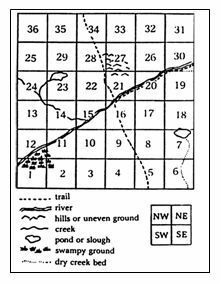 In the 1871 agricultural census, the farm on Lot 18, Concession 4 was shown to consist of 104 acres, 50 improved, 20 in pasture, 1 in garden/orchard and 14 acres wheat. They had 1 milk cow, 9 sheep, 1/2 acre potatoes, 20 bushels turnips and 40 pounds of maple syrup. Farm equipment consisted of 1 carriage, 1 wagon and 1 fanning mill. By the time of the 1871 cenus, Sarah Milligan was listed as a widow, living on Lot 35, Range 3, Bentinck Township which backed onto her sons’ land. This photo of James and Annie consists of two photos put together. James was 12 years older than Annie in real life. This photo makes it look like they are the same age. In 1879 Annie and James Milligan sold Lot 18 to Abraham Porter and moved to Lot 20, Concession 7, Gordon Township, near Gore Bay, Manitoulin Island. 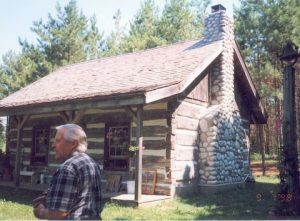 The back end of the lot was covered with limestone and James had built a lime kiln where lime was made for their log buildings. Their family eventually consisted of eleven children: Annie (1864), Robert Wallace (1866), Gordon (1868), John (1871), Susan (1873), Sarah (1875), William (1877), Joseph (1881), Marian (1883), Agnes (1887) and James (1889). In 1880 this land was registered from the crown, by James and Annie (McPherson) Milligan who had arrived from Durham the previous year. They had quite a large family, with some of them likely born before they came. There was Wallace who later married Ester Best from down the road,and bought the farm next door (Bert Best place) in 1905 and lived there for approx. 15 years until the family moved west (following Esther’s death in the flue epidemic of 1918). 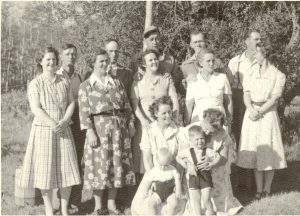 Others in this family were Joseph, John, Gordon, William, Jim, Marion, Agnes, Susan, and Sarah, known as Sadie. Some in this family never married, but Gordon wed one of the Moore girls from the 7th line (it was apparently their child who died in the fire at the Card House). Susan married a Srigley, [note this is wrong. Annie married a Srigley] and Sadie wed Wes Hamilton, a brother of Hollis. The Milligans built the barn that is still there today, a nice frame structure. Their log home was a large one, complete with a fireplace. Mrs. Milligan had the convenience of summer kitchen, a separate log building behind the house containing a stove where she could do her cooking in summer without heating up the house excessively. The first W.I.meeting in Gordon took place at this home out under an apple tree, in 1910. In 1912 it changed ownership to son Joseph, likely upon the death of Mr. Milligan. Joseph never married, and the family continued working the land. This farm is not a full 100 acres, as it goes back to the lake. In fact quite a steep bluff down near the lake makes the back part suitable only for pasture, and approx. 30 acres is cleared. In 1917 it went into the possession, just briefly, of son-in-law Wes Hamilton. 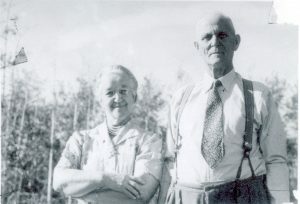 The Milligan clan had begun the move to new and exciting frontiers out West, moving to an area near Edmonton, and in 1918 the farm was sold to a stranger, John (Jack) Dinsmore. James Milligan died January 18, 1911. In his will, he left his horn spoon and a silk handkerchief to his son Gordon, in addition to the usual financial arrangements for his wife. 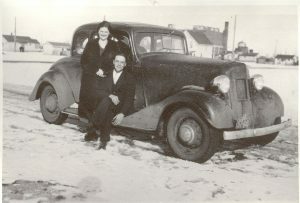 Annie moved to Mannville, Alberta in March of 1918 and lived with her son Joe who had not married and with Gordon whose wife and child had died in a fire. 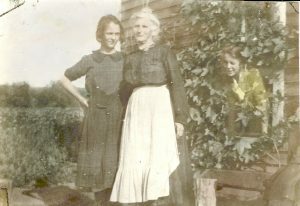 Daughter Sarah [Sadie] and her husband Harry Hamilton also moved to Mannville in 1919. Annie died January 23, 1935 at the age of 90 and was buried in the Mannville Cemetary. This is how townships were laid out across the Prairie provinces. SW 21-56-23 W. 4th meant the southwest quarter of township 21, range 56, west of the 4th meridian. John (1871-1952) moved west in 1898 to New Lunnon (later Bon Accord), Alberta. Prior to that time he and his brothers had worked in lumbering and on the Great Lakes boats. 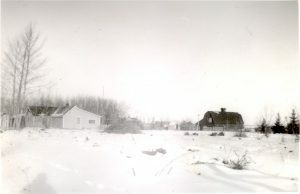 On arrival in Alberta he worked on the farm of David Crozier at Namao. With ten dollars in his pocket, a borrowed white horse, and twenty feet of rope, he filed on homestead in the Bon Accord District (S.W. 16-56-23-W4). Here he built a shack with a sod room and cleared fifteen acres the first year. He found it necessary to defend his homestead claim in a statutory declaration October 16, 1899 made at Coldstream Ranch, Vernon, BC. Karl Neilson applied for inspection of the homestead (meaning to take it over), since John had not been on it for 14 months. In the declaration John said that he had worked six months in lumbering in Robson, B.C. and then six months in the hop yards at Vernon. He wrote that the reason he was not on his homestead was : “I am a poor man with small means and am down here making money to improve my homestead there and get my stock & implements out from Ont. Gore Bay Manitoulin Island”. John built a two-storey house made of logs before marrying Edith Hewitt on January 1, 1902. The wedding of John and Edith was the first one in the Bon Accord District. 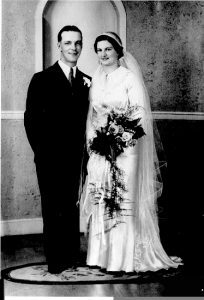 The wedding was reported in the Edmonton Bulletin as being “very pretty”, held at the residence of the bride’s brother, Geoff Hewitt of Excelsior. The bridesmaids were Hanna Lewis (a neighbour) and Flossie Sellick (sister of Frank Sellick who married Marion Milligan). William Milligan, John’s brother, was best man and the officiating clergyman was Rev. J.C. Wace, incumbent of the Sturgeon Mission. Walter Thomas Brindley Hewitt, the bride’s brother, came all the way from South Africa to give Edith away at her wedding. In January 2, 1903 their first child Mary Ann Eli (Mollie) was born, followed by Marjorie Rachel (Mardie) in 1905, James Benjamin in 1906, Albert John Robert (Jack) in 1908, Thalia Edith in 1911, Jean in 1913, Sarah Kathleen (Sadie) in 1915, and Geoffrey Eaton in 1922. When John Milligan went to register his children’s births sometime after the fact, he registered Jim and Jack as being born in 1907 and 1909, assuming that all of his children had been born exactly two years apart. This error was not corrected until Jim and Jack realized they would qualify for the old age pension a year later than they were entitled. Marion Florence Milligan, John’s sister, lived with the family until her marriage to Frank Sellick in 1913. Another of John’s sisters, Agnes, had married Ernest Hewitt, Edith’s brother. When Agnes died in childbirth in 1911, her daughter Agnes Victoria was adopted by John and Edith and raised as a Milligan. An older daughter Marion also lived with John and Edith until her father remarried and asked for her back. 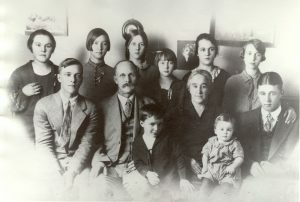 The photo is of the family c. 1925. John Milligan expanded his land holdings and at one point had 16 quarter-sections. He built a hotel in Bon Accord in 1914 which housed the first bank, a barber shop and restaurant. In 1942 the youngest son, Geoffrey Eaton was killed in World War II. He was a pilot (at the age of twenty) and was shot down, over Polder St. Philipsland, Holland. See; Victims of World War II on St. Philipsland;. John and Edith retired to Victoria in the 1940s. They celebrated their fiftieth wedding anniversary at Bon Accord on New Year’s Day, 1951. John died in May of 1952 of a liver ailment. Until Edith’s death from congestive heart failure in 1960, she lived with her daughter Thalia “down home” . 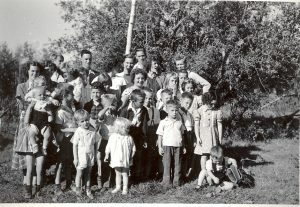 In 1949 two photographs were taken that show most of the family, children, in-laws and grandchildren (excepting those born after that date). Jack attended the Vermilion School of Agriculture and graduated from the University of Alberta with a degree in Agriculture in 1929. Meanwhile Hilda graduated from high school at the age of 16. Although she wanted to go to university, her parents sent her to Normal School instead and she became a teacher. Her first teaching position was at Glidehurst, near Devon. After three years at Glidehurst, a largely Ukrainian settlement, she was hired to teach in the Junior Room at Bon Accord, on the basis of her having taken Latin. Hilda boarded with Mrs. Whittaker, and she met Jack at a dance at Bon Accord. Her boyfriend Art Potter introduced them. SW 21-56-23-W of the 4th before 1950.